The Kenworthy Performing Arts Centre and Disability Action Center NW will be kicking off their fundraising efforts with a free Zombie Fest on October 2, at the Kenworthy. 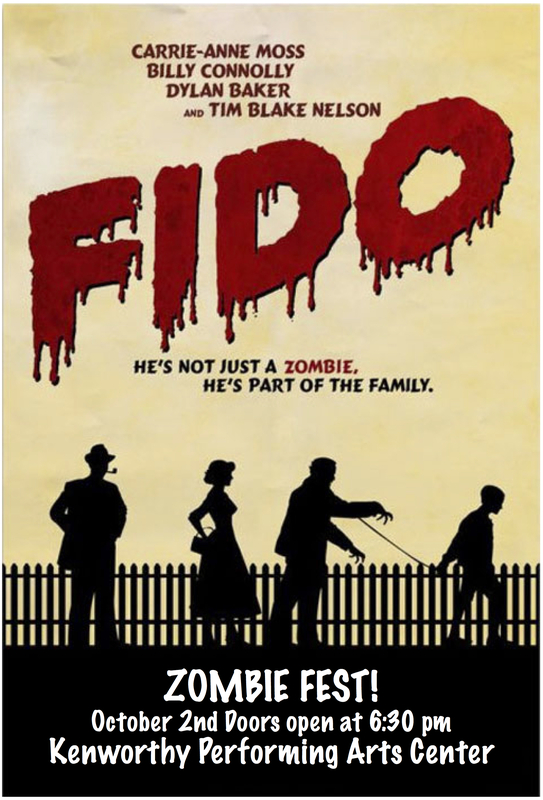 The event features a screening of the fun zombie film “FIDO”, where in this futuristic 50’s styled world, zombies have been domesticated to become menial workers and pets for humans. 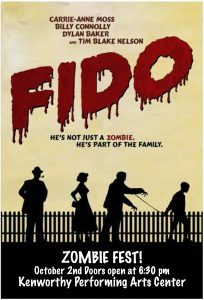 It’s rated R due to some “zombie related violence” but if you love zombies, is pretty good for ages 8 and up. Several of DAC’s staff have volunteered to be made up as zombies using wheelchairs and walkers. Seems like if 25% of the population has some kind of disability, then 25% of zombies should have a disability! Expert make-up artist Mike Long will be applying the make-up and the roaming zombies will be available at the event for photos and selfies. A screening of the 4 zombie shorts that DAC NW created will be shown before the film. These are the basis of a “Don’t Be A Zombie” campaign that points the finger at zombies for interacting incorrectly with people with disabilities. Free zombie “Don’t Be A Zombie” t-shirts will be given out while supplies last. A person can come as the zombie they are or get a quickie zombie make-over at the event for a small donation. Zombie candies and raffle prizes, discounted college basketball tickets, and fun social media interactions round out the event. October is National Disability Employment Awareness Month, and it seemed like the perfect time to kick off the “Life Happens on a Stage” fundraiser. This 5 month long campaign will raise $30,000 for a portable stage lift for the Kenworthy. It’s stage is currently inaccessible and a ramp is out of the question. The new lift will be available to the community so that other arts events can be ADA compliant. “Life happens on a stage, whether a graduation, wedding, or taking part in civic theater,” said Christine Gilmore, Executive Director for the Kentworthy, “and everyone should be able to participate.” $5,500 has been raised so far. This partnership between the Kenworthy and DAC NW shows the commitment both agencies have for being inclusive for the community. “Working for changes that remove physical, communication, and attitude barriers for people with disabilities is our mission, so we are focused on this,” said Marketing Specialist Vicki Leeper. Doors open at 6:30 and the film screening will start around 7:00 pm.